Detective John Jones has a case to investigate. Fortunately, he has a witness – an iguana. 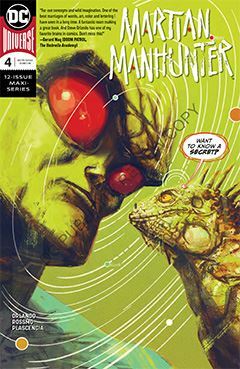 But because John Jones is also J’onn J’onzz, aka the Martian Manhunter, he can read minds – including those of animals. The downside is interpreting the memories of lower life forms can be a challenge. It is only now, in its fourth issue, that this miniseries begins to develop a story of its own. We’ve revisited MM’s origins and motivations; now it’s time to put him to work. As a six-issue series, we don’t have much time to work with, but no doubt there is hope for an ongoing series. DC Comics seems intent on cultivating some of it lesser characters, perhaps for exploitation on film and television. I can appreciate the goal, but I find the strategy flawed. Many of the B and C-listers who have moved up in the past few decades have done so as part of a bigger cast. Wolverine in X-Men and Harley Quinn in Batman and Suicide Squad, for example. J’onn did well on the Justice League cartoon, but perhaps making much more central to the JLA franchise might be a better strategy. Allowing him to grow and develop, then launch him in his own series. But it could be argued DC Comics is doing exactly that right now.